For more than two decades Appliance & Refrigeration Hospital was served and led by a remarkable duo, Bill & Nancy Sehorn. Many of our current team members were privileged to have worked with them before they retired in 2001. Bill & Nancy were like parents and grandparents to the ARH team, and like best friends to customers. We have all been the recipients of the goodwill they generated. Bill Sehorn has been diagnosed with Parkinson’s disease, and is dealing with all the struggles this includes. 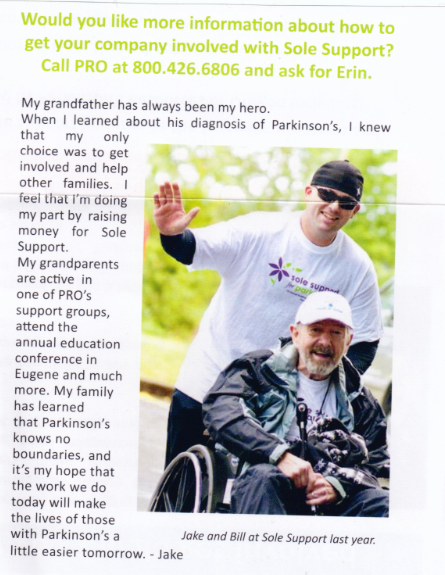 Our desire is to support him and his family in all the ways we can, and one way is to participate in Sole Support for Parkinson’s. ARH will be participating in a walk and fundraising event on September 23 at Willamette Park at 1:30. We encourage all of you to join our team and registering to walk with us, or support our team by donating here. Below is a picture of Bill and his grandson on an earlier Sole Support Walk.